Coming soon to London – a collection of 17 new oil paintings to be shown in my forthcoming solo exhibition ‘There and Back’ at Panter and Hall from May 1st – May 11th 2019, just 5 minutes walk from Piccadilly Circus. I will be resident in London for the first week of the show, and look forward very much to introducing old friends, loyal collectors and new faces alike to this fresh body of work created especially for my first London show in 22 years. When Mathew Hall and Tiffany Panter first visited my Edinburgh studio in November 2017 to discuss an exhibition, little did I anticipate the adventure of completing a body of work while moving house and building a new studio. 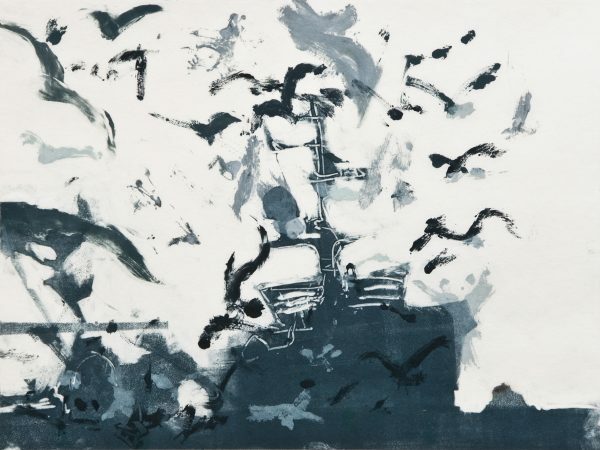 The movement between city and country, has become the subject for the exhibition, both on a personal level but also reflecting the wider state of flux in all our lives as we struggle for political sanity in the midst of a changing climate. These new paintings represent key elements in that passage though all these turbulent times. Free Lunchtime Artist’s Talk will be on May 2nd 1-2pm, booking advisable though the gallery. An e-catalogue will be availiable on the gallery website from April 20th. 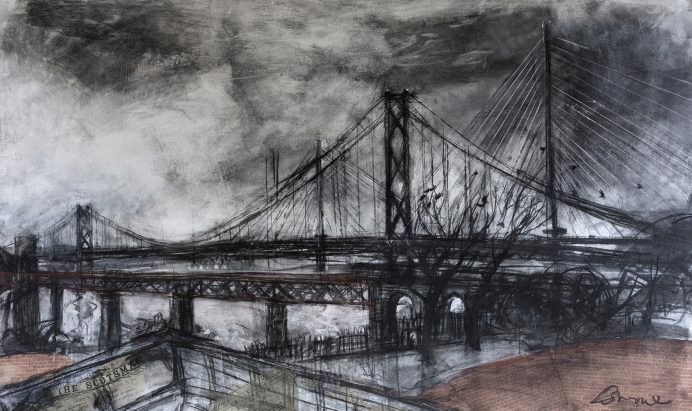 This exciting exhibition with works by many of Scotland’s leading artist-printmakers can be seen at the Academicians Gallery and Finlay Room of the RSA in Edinburgh from 13th April to 12th May. All works available for sale. This triptych ‘Spanning the Beautiful River Shore to Shore’ will feature in this exhibition, and was inspired by my commute from Fife to the DCA Print Studio in Dundee. 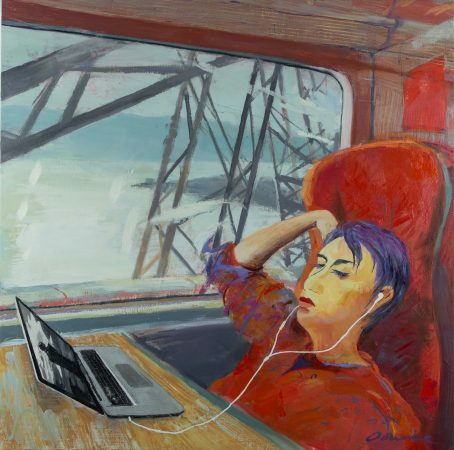 The title is a quote from William McGonagall’s poem celebrating the opening of the new bridge spanning the Tay Estuary following the disaster of the first Bridge. Monoprint & etched aluminium on Xuan paper on Somerset. I am delighted to announce that not only have City Arts Centre recently added two large drawings in charcoal on primed paper from 2005 ‘Conversation’ series to their permanent collection but also commissioned a third major drawing in 2018, acquired through the Jean F Watson Bequest. Dates of their launch to the public eye to be announced! Here is the new drawing, marking the addition of the third crossing of the Firth the Forth at Queensferry. It has been great working with one of my musical inspirations in traditional Scottish song Christine Kydd. Early this year she launched her wonderful new CD Shift and Change . This album features one of my early Norwegian series of mono prints ‘Coming into Port’ on the cover and was the first print that I created through my experiments in looped film footage. This collaboration has inspired two new workshops and will also be the subject of a forthcoming solo show Nature Vivante at the Garden Room of the Scottish Gallery in October 2019. In the meantime, such has been the popularity of the album and the cover image that I have now made a limited edition in ink jet print on archival paper available for purchase here. 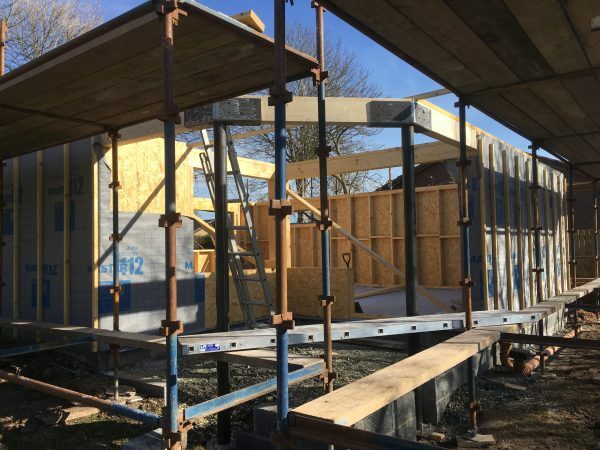 And finally – the new studio construction in Ceres is growing as fast as the trees are bursting into bud! It should be finished by the summer. Wishing you all a happy and hopeful Spring. Copyright © 2009-2016 Kate Downie. All images on this site are copyright. Please do not use them without permission.